The best content for your business isn’t always what you expect it to be. You probably know that good content is useful for just about every industry, and is a well-documented way for e-commerce businesses to generate more revenue. But sometimes, brands need time to figure out what works best for them. That means you need a healthy dose of experimentation, mixing up and trying different formats, or enlisting help from content experts. Wild West Pool Supplies did all of these, and they finally found what works for them with a little bit of help. 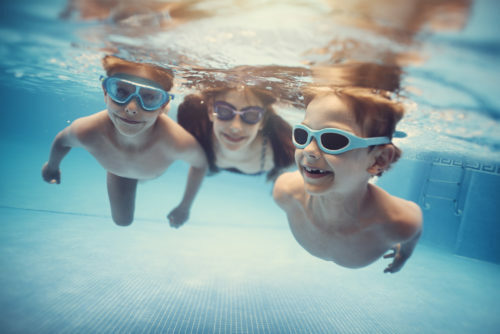 They’re an e-commerce business that wants to help people enjoy their pool fully through better equipment and less maintenance. We talked to Mark Zalewski, co-founder and CEO, about his experience with content creation for Wild West, and he shared how Verblio’s content expertise allowed his business to be swimming with new customers. Back in 2016, Mark had a problem. His company, Wild West Pool Supplies, was looking for ways to beat out the competition and bring a fresh perspective to the highly-competitive pool supply industry. Current reports suggest that pool supply companies generate more than $5 billion in revenue each year, but the old-school way of doing business simply meant waiting for customers to find you online. That didn’t sell well with Mark. 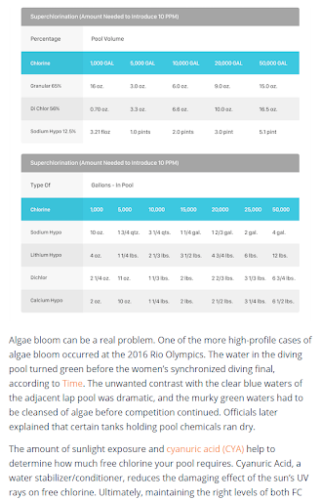 I knew that if we were going to truly help pool and spa owners by adding more value than our competition, we were going to need to generate better content. At first, Mark thought that the best way to add value was through educating customers via blog posts. He felt that it was the best way to differentiate his brand from the competition, and knew that blogging had other benefits like SEO. He would later find out there’s a good more to it than just that, but it was at least a starting point. When it came to actually creating the content, he had a laundry list of questions and needed a way to swim upstream and find reliable answers. Should they write long-form or shorter blog posts? Who should the content target? What topics would resonate with that audience? How would they share the content with this audience? What channels? Are there any writers for their industry? Reliable ones at that? 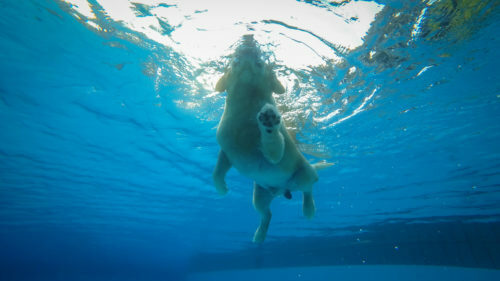 Despite this, Mark decided to dog-paddle through a few potential solutions. His first attempt at finding an e-commerce content creator was with super cost-effective marketplaces like Fiverr, but the results were underwhelming. The blog posts they received didn’t reflect industry expertise, and weren’t well-written (or even readable!). He also thought that maybe creating e-commerce content internally would work, but no one on his team had time or the writing ability to create compelling content. And unfortunately, he definitely didn’t have the budget to hire a full-time writer. These experiences only reinforced Mark’s desire for good blog content, but didn’t help him actually get the content he wanted. And Wild West needed a way to consistently and reliably outsource their content to ensure that they never had to worry about those minor details ever again. I was talking with a friend about how we were not having much luck finding writers for our industry at scale. She told me about how she solved her e-commerce business’s lack-of-good-content problem with Verblio and also how easy Verblio was to use. So we tried it out. When Mark brought Wild West to Verblio, he was still stuck on blog posts. He wanted writers that could meet his needs and expectations without much oversight. And after receiving a few high-quality blogs from Verblio writers, Mark was convinced he had found his solution. Wild West would generate a topic, and then determine a keyword with SEMrush, Google Adwords Keyword Planner, along with other tools. Then, they would find a specific writer that could match their tone and work with them through the assignment by trading unlimited edits on the Verblio platform. And in just a few months, they began seeing Wild West climb in the search engine results page, driving more and more traffic as a result. But with a limited budget, they needed to focus on the elements that would guarantee a strong ROI. When we first started with Verblio it seemed like it was a place to go to for blog posts if you give them a topic. We saw this as a way to increase authority in Google’s eyes, but didn’t drive ROI the way we wanted. We quickly learned that it was also ideal to get really good product descriptions and category page content too. This drove up our rankings for for specific, high-margin products and brought the return we were looking for. And Mark was right. Some e-commerce brands have managed to double their sales thanks to better product descriptions. They help with SEO, and make a big difference when customers are trying to finalize their purchase decision. So instead of staying one-dimensional, Mark and the team at Wild West decided to branch out and expand their framework. They decided to go all-in on their product descriptions on top of their blog production. This layering effect only deepened Wild West’s content offering, and sparked their biggest SEO gains. They gave Verblio writers everything they needed to get started. Product names, specific brands, SKUs, their competition’s URLs, and even discounts they offered. The writers would then research more specifics and create unique e-commerce content that was chock-full of helpful information. The difference was instantly noticeable. The newer product descriptions have more copy, go in-depth about how the products should be used, and include unique (non-copied) bullet point features that make them easy to scan and digest. The turnaround time was quick, and all we had to do was publish the content on our site. Super simple to use and on-demand. Eventually, the process got even quicker. They “preferred” a few writers they really liked and understood their brand and mission well and continued to closely collaborate and iterate with them. At this point, they were swimming confidently, drafting off their initial successes. But with thousands of products and a wide variety of categories, it was especially hard to know what to do first. And they didn’t want to stop at product descriptions (which they currently have 155 of so far, courtesy of their trusted Verblio writers). So they started to pursue better SEO for their category pages as well, adding 600+ word descriptions below their products in each category. This approach eventually evolved into long-form content, but they knew it would be super niche and boring if done poorly. 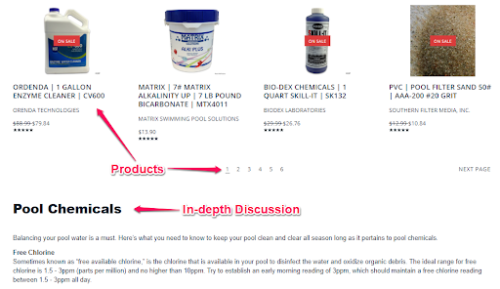 Who likes to read about in-depth topics like pool chemicals? 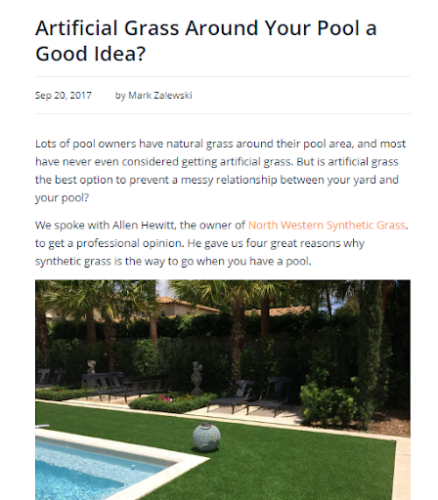 Even though pool chemicals are essential, they’re a complex topic to write for the layman pool owner. 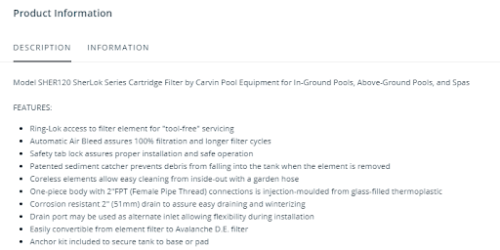 Plus, solutions vary vastly between pool owners. You can’t cover that type of issue with a single, short article. The solution to all these pain points was a 2,000+ word comprehensive pool chemical resource guide. Mark was ready to tap his already established, trusted pool (yes, pool) of Verblio writers to get it done. They put together an outline of different areas they wanted the writer to cover in the piece based on their expertise and their previous experience creating related content. They then connected with an expert through Verblio and collaborated to ensure that the content was top-notch. And since it was far easier to do than they’d thought, they’re already planning the next major guide for their audience. Mark saw his content go from 0 to 100 in a fast-paced content revolution. Even though Wild West started with blogging and now are exploring long-form, their biggest success story is their product descriptions. When they started using Verblio, they decided they wanted 500+ words to comprise their product descriptions. Each product description had to be researched, well-written, and deliver as much value as possible to its audience of middle-class American pool owners. Now, when they get buyer reviews, their product descriptions get specific callouts as a leading reason for why customers decided to go with Wild West. That means they’re delivering the information that their customers both want and need, AND that the customers have noticed. We realized that Verblio saves us weeks of time that would otherwise be spent finding and reaching out to various writers with knowledge in our industry to create that content. If we were writing all of that content in-house, it just wouldn’t be as feasible, turn out as good, or be produced nearly as quickly. So let’s look at a few pieces of content that helped fuel this revolution. 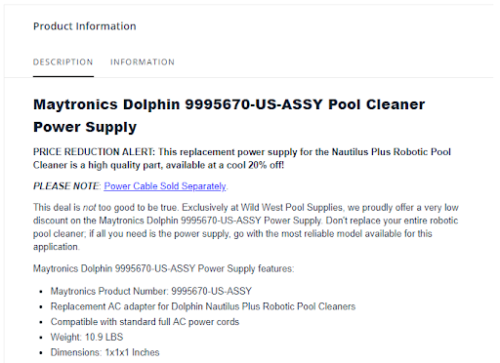 One of the most notable pieces is the product description for this Maytronics Dolphin Power Supply. Before getting their content revamped, they called this page “the abyss” because no one ever visited its uncharted waters. What made this shocking was the fact that this is a highly competitive and very popular product. Even though it’s one of the most widely used products on the market, they hardly saw any traffic. 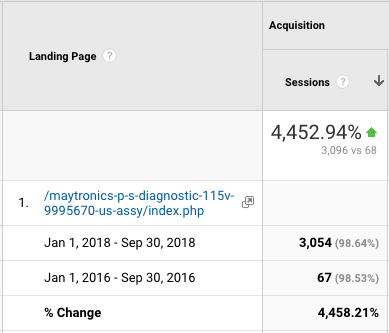 Google Analytics revealed the time on page was only a few seconds long, and they saw almost no conversions. Half-baked content wouldn’t cut it. But they also had nowhere to go but up. So they gave their Verblio team of writers a very specific set of instructions for this product. Incredibly thorough with zero mistakes. It’s interesting, compelling, easy to scan, and highlights everything you need to know about this product. And over the course of two years building content with Verblio, they saw traffic spike 4,452.94%. As you could imagine, this translated into a virtual tsunami of sales for this product, turning a once dried-up abyss into an oasis. It’s currently one of their bestsellers. 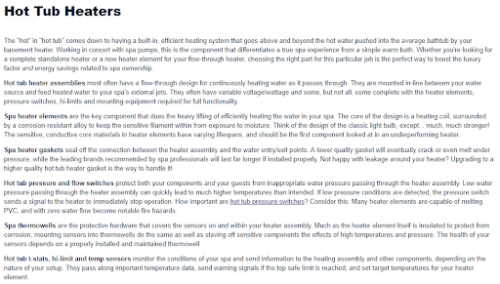 A different example of a piece of content that saw drastic improvement is their Hot Tub Heaters category page. 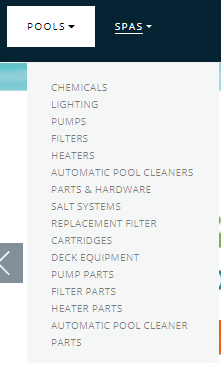 Again, this is another competitive search for the pool supply industry. Before Verblio, they didn’t see any organic traffic to this page. But once they added descriptive, informative, unique, and process-tuned content like the example above, it instantly started generating traffic and conversions. 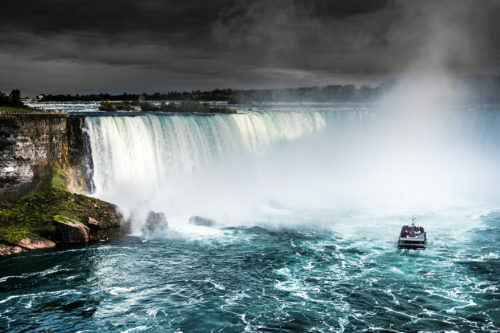 Now, they’ve added this type of e-commerce content to four of their high-priority category pages, and the overall spike in organic search traffic is like the difference between a faucet and Niagara Falls. Prior to consistent blog and product description e-commerce content creation, Wild West organic traffic was approximately 50-60 visits a day. Paid traffic was nearly triple that amount, roughly 150-200 visits per day. Over 76% lift in organic traffic—contributing to over 250% higher revenue from organic traffic. Higher quality scores in Google Shopping, meaning better paid positioning and lower CPC costs. Improved customer loyalty, with many customers returning to buy four or more times. Content has become a vital component in generating happy customers and accelerating growth for them. So what’s next for Wild West? If you talk to Mark about content, it’s easy to see him get excited. They’ve been with Verblio for two years, and he feels that they’ve only begun to scratch the surface of the content that they can produce. There’s a lot more organic search traffic to win, and it’s clear that excellent e-commerce content has a far-reaching impact for Wild West. We’re in the process of adding thousands of products to our catalog—many of which are in high demand and therefore are quite competitive. We know that if we’re going to be successful in selling these popular products, we’re going to need good content and a LOT of it. That means plenty more product descriptions, category page content, blog posts, and resource guides on the way. Even paid traffic, email, and social content are in his crosshairs for the coming years. And with good content in his product descriptions and on his category pages, it’ll be easier than ever to close more business. That’s the power of great content that works to pull a brand’s message together. Combining a multitude of content types will flow together and converge into a roaring river of traffic and sales that propels Wild West forward. Content changed the way Wild West runs their business for good. At Verblio, we know the e-commerce content marketing formula for success is an all-around effort. You need product descriptions, robust category pages, regular blogging on top-of-mind topics for your audience, and long-form content in the form of ebooks or guides if you want to be successful. And we do our best to help generate that content while co-creating with you behind the scenes. And Wild West would echo these sentiments. All four types of e-commerce content worked for their brand, and they’re forging ahead to make even more. But without a little help, they never would have seen the enormous growth over these last two years that they have. E-commerce businesses need good content to generate traffic and conversions. It has to be useful and well-written to get Google’s attention and keep your potential customers interested. Verblio can help you dive in and succeed just like Wild West. If you’re struggling to keep your e-commerce content creation efforts afloat, stop floundering and let us help. I write and market (yes, verb) at Verblio. Whether that's a blog post, email subject line, social media update, or a lousy author bio like this one, if you've been around Verblio you've likely seen some letters I threw together. I love helping get the word out about Verblio to get all sorts of folks good content to market themselves. Apart from Verblio, I'm really passionate about puns, foreign languages, Colorado at large, staying active, and leprechauns.